The missing piece of the renewable-power jigsaw may now have been found in the form of a new type of flow battery. THERE is nothing so expensive, some cynics suspect, as free fuel. It is not that turning wind and sunlight into electricity is itself that costly, provided you pick the right places to do it. But it is not reliable. The wind does not always blow, and even in the most cloud-free desert night falls with monotonous regularity. Political commitments to use large quantities of renewables, such as several European countries have made (see following story), thus risk the lights going out. The search therefore has been on for a cheap way to store energy transduced from sun and wind when it is plentiful, so that it can be used when it is not. Many approaches have been proposed: pumping water from lowlands into mountain lakes serving hydroelectric plants; filling hermetically sealed caves with compressed air; creating arrays of giant flywheels; even storing electricity in huge superconducting rings. The most obvious, though, is to use batteries--if only they could be made big enough and cheap enough. Advocates of this idea are particularly enamoured of a design called a flow battery, in which two liquids, each in contact with an electrode and separated by a membrane that is permeable to hydrogen ions, jointly store the energy put into the battery when it is charged up. They do this in a pair of chemical reactions that push hydrogen ions through the membrane without the liquids coming into direct contact. Then, later, the liquids can be made to release the stored energy by transferring hydrogen ions back through the membrane. This generates electrons, which flow through an outer circuit to do useful work such as lighting people's houses. The discharged liquids are then available for recharging. Because the energy-storage media of such batteries are liquid, they can be pumped into holding tanks once charged up. Flow batteries can thus, in principle, sequester huge amounts ! of energ y. But they will solve the renewable-storage problem only if they can be made of cheap material, and at the moment they are not. The storage media require salts of expensive metals such as vanadium, and the electrodes sometimes have to be coated in platinum, or similarly rare catalytic metals, if the whole caboodle is to work. Which is where Brian Huskinson, Michael Marshak and their colleagues at Harvard University come in. They think they have worked out a way to make both the liquids and the electrodes cheap. The solution Dr Huskinson and Dr Marshak propose, in a paper in Nature, is to use molecules called quinones, mixed with sulphuric acid, on one side of the membrane, and a mixture of bromine and hydrobromic acid on the other--and to make the electrodes out of carbon. Quinones are molecules composed of carbon, hydrogen and oxygen that ionise in similar ways to metals like vanadium. Anthraquinones--the class of quinone employed by Dr Huskinson and Dr Marshak--can be synthesised cheaply because their precursor, anthracene, is a component of crude oil. And anthraquinones already have a number of industrial applications, for example in the paper-pulp industry. This means an infrastructure to make them already exists. The question was, would they be as good as vanadium in a battery? Dr Huskinson and Dr Marshak found that, with a suitable material on the other side of the membrane--namely the bromine/hydrobromic acid mixture--they were. The anthraquinone they chose, called AQDS, reacts with the sulphuric acid in a way complementary, with a suitable transfer of hydrogen ions, to the way bromine turns into bromide ions, the non-hydrogen part of hydrobromic acid. And it does so without the need for a metal catalyst. 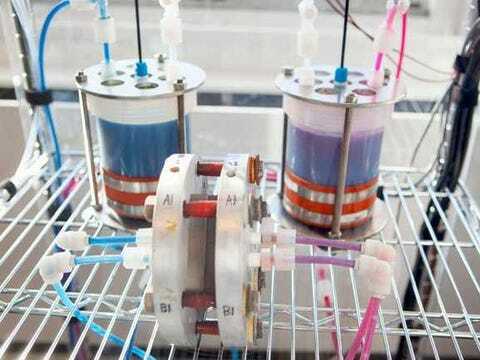 This particular flow battery is just a proof of principle. But it is an important one. Being able to use organic molecules instead of metals changes the battery-making game completely. If battery-makers have to use metals, they are restricted to wh! at the p eriodic table offers. Using quinones they can tweak their materials by adding and subtracting atoms to get the properties they want. That, plus the low cost (Dr Huskinson and Dr Marshak estimate $21 per kilowatt-hour of storage capacity for the AQDS and a further $6 for the bromine and hydrobromic acid, as against $81 for a vanadium-based system even before any platinum electrodes used are taken into account), means the future looks bright for quinone-based flow batteries--and thus, by extension, for renewable energy.